We’d love your help. Let us know what’s wrong with this preview of Toxic Feedback by Joni B. Cole. To ask other readers questions about Toxic Feedback, please sign up. I have always thought of myself as "thicked skinned" when it comes to receiving feedback on my writing (and to be put more generally, life). And while it was easy to sort of brush off criticism, I never imagined there was a proactive way to manage that feedback (even that which I might have labeled as the worst or useless feedback) into improving my writing whether it was creative pieces or things I was assigned at work. This book has given me a whole new perspective, and even more importantly, the tools to channel all feedback into productive and useful responses that give me a fresh and different angle on my work. One of the elements I found the most useful in the book was the clear and concise models for not only receiving but also giving feedback. Another great element is the fantastic examples of published authors who have experienced feedback that almost kept from them writing. There are examples from authors such as Khaled Hosseini who wrote the Kite Runner, which was almost never published and an interview with American poet laureate Ted Kooser (to name a few). Finally, as someone who attends writing workshops, I have highly recommend this book to all my peers. Joni lays out tips and ideas for successful writing groups including how to respond proactively to group members' work and how to maintain a professional but comfortable environment where people are not afraid to share their work. It has helped me enormously in my participation in writing groups. 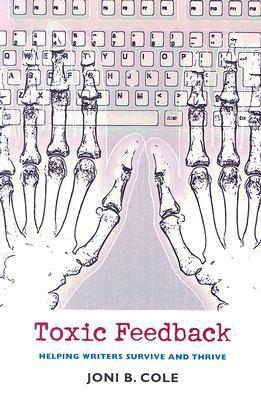 Toxic Feedback was written by an author to authors about the whole feedback process. But it would be a great book for anyone giving or receiving feedback. Oh wait that's all of us. The book is divided into three parts. The first part talks about receiving feedback, the second part talks about giving feedback and the third part talks about the mechanics of running a feedback group for writers. Favorite quote: Almost every writer [body] has a story, some sad tale about how a teacher, fellow writer, Toxic Feedback was written by an author to authors about the whole feedback process. But it would be a great book for anyone giving or receiving feedback. Oh wait that's all of us. This book was lent to me by a friend who took a class led by the writer. I don’t normally read a ton of books on writing but I’m glad I gave this one a shot. She is SO funny and relatable but still with such a unique voice. A must read for anyone invoked in critique. I have to admit, when I heard Joni Cole had asked Write Anything to review her book Toxic Feedback (University Press of New England, 2006)--an elemental discussion on how to give and take criticism, I was looking forward to reading it. I just finished the final edit of my current thriller ( is it ever really final in the writing world? ), which meant I no longer had to submit to the well-intentioned-but-depressing opinions of my writer's group. They just don't understand how to provide positive c I have to admit, when I heard Joni Cole had asked Write Anything to review her book Toxic Feedback (University Press of New England, 2006)--an elemental discussion on how to give and take criticism, I was looking forward to reading it. I just finished the final edit of my current thriller ( is it ever really final in the writing world? ), which meant I no longer had to submit to the well-intentioned-but-depressing opinions of my writer's group. They just don't understand how to provide positive critiques--the type that motivate a writer to do better and not give up. Every time I've been the bulls eye of their reviews, I've come home swearing to never write again. There are two possible reasons: 1) the members don't know how to critique, or 2) I don't know how to accept criticism. Or both. Who knows? Either way, when this opportunity showed up in my email box, I figured the Universe was talking to me. Granted, I didn't miss the conundrum of critiquing a book on criticism. What if I didn't like Cole's book? Could she accept my 'toxic criticism'? * most criticism isn't as bad as it sounds. We at the receiving end of it merely think it's a razor blade aimed at our jugular. Cole's book is easy to read, with lots of anecdotal experiences from successful writers about their experiences with toxic feedback. She addresses the nightmare of a writer's world with a light sense of humor and a depth of understanding that tells me she's seen one too many flawed critiques. Of course she has. Cole's writer's workshops attempt to guide new authors not only in writing skills but how to handle the inevitable criticism that comes with the territory. Most of us equate 'feedback' with 'criticism'. She explains the concept of feedback, defines it, discusses it from the viewpoint of those who give and those who receive, shares educated thoughts on its relevance in a writer's ultimate success. She offers ways to tell writers if feedback is true (such as, is there a consensus of opinion on a particular point) and tips for processing it (resist the urge to explain your position; ignore feedback until you are ready for it). Cole has a folksy, friendly voice that makes me want to listen, like a friend who understands my concerns, my backstory. She reminds readers that 'criticism' is neutral. It isn't always the bad stuff. As often (or more often--maybe as much as 3:1) it should be what the writer is doing correctly so they don't throw the baby out with the bath water. She even provides guidance for taking criticism from your editor (you don't have to capitulate) for those of us with editors who actually... edit. This review has been hidden because it contains spoilers. To view it, click here. I joined a writing group recently. So when I saw a book at the library entitled Toxic Feedback, geared at teaching writers how best to use and to give feedback from/to other authors, I immediately wanted it. Sadly, this book was mostly a pity-fest. The section on Taking Feedback from Others was pretty much a long, woebegone whine that sometimes feedback can be icky. Some people only tell you, "The whole thing sucked." Some people just don't like killing animals, so any scene you write (no matter I joined a writing group recently. So when I saw a book at the library entitled Toxic Feedback, geared at teaching writers how best to use and to give feedback from/to other authors, I immediately wanted it. Sadly, this book was mostly a pity-fest. The section on Taking Feedback from Others was pretty much a long, woebegone whine that sometimes feedback can be icky. Some people only tell you, "The whole thing sucked." Some people just don't like killing animals, so any scene you write (no matter how poignant) which includes animal death cannot please them. This section takes well over a hundred pages and is mostly sob stories of "Bad Feedback Happens." The section on Giving Feedback was much shorter and pretty much said "constructive is better" and "don't count the number of times the same thing annoys you; just give an overall mention." In other words, don't bother with this book. It's lame. Joni B. Cole addresses neuroses and offers strategies for making a writing group work for you: “Be open…. Resist the urge to explain….Ignore feedback until you are ready for it….Try out the feedback….Give yourself time.” She makes feedback sound like a partnership, not a pecking order. Her suggestions give me room to breathe, grow, and ignore what does not work. Cole’s writing sparkles with humor and honesty. She shows what works while celebrating growth she has seen, and the power of positive f Joni B. Cole addresses neuroses and offers strategies for making a writing group work for you: “Be open…. Resist the urge to explain….Ignore feedback until you are ready for it….Try out the feedback….Give yourself time.” She makes feedback sound like a partnership, not a pecking order. Her suggestions give me room to breathe, grow, and ignore what does not work. Cole’s writing sparkles with humor and honesty. She shows what works while celebrating growth she has seen, and the power of positive feedback. Advice from eleven well-known authors reinforces the importance of feedback being a tool, not a mandate. Toxic Feedback makes me crave the kinds of responses that will expand my mind and make me productive. This is actually a quick read (being a pretty short book) but it provides much food for thought & great discussion ideas to talk to my husband about. So I'll probably be 'reading' this for a bit longer. I loved this book. The author was so humorous and self deprecating in a confident way that I felt like she was speaking directly to me. I found her tips so helpful, and I also found that I could relate to many of the thoughts and feelings she expressed. A useful, practical little book to help protect against the inevitable wounds of feedback. Wish I had read this earlier than I actually did. Excellent book about giving and receiving feedback--useful for life, not only writing. Well I think it's a fantastic book that every writer, writing instructor, workshop member, or person who has ever had to send food back in a restaurant should read. But of course I'm a bit biased. I loved this book. A great read to inspire confidence in giving and receiving feedback about writing.